Hours: Open during tour and by appointment and the First Friday of the month form 10am to 6:30pm. 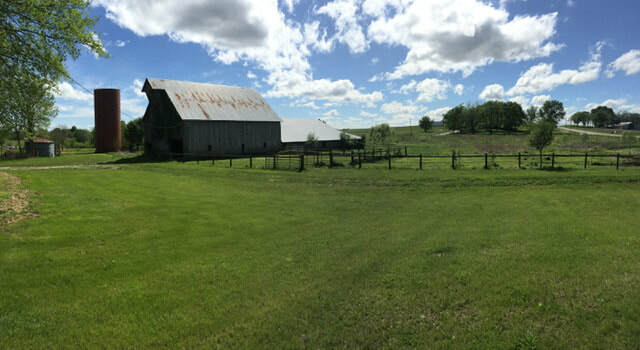 Amy’s Meats is located at the Saunders family homestead in the hills north of Lawrence. Amy, Dan and their growing family moved into the valley in the fall of 2010. Since then they have diversified not only in the practices, and crops grown but in livestock as well. The family strives to produce everything they eat and share the abundance with the community. They raise livestock naturally and are caretakers of Jersey dairy cows, pigs, sheep, chickens, ducks, the land, and the honeybees, which have an observation window into the hive. They also have 2 acres of heirloom vegetables and grains in a permacultural setting. Amy offers three types of CSAs: a Mixed Meat and Veggie (& Eggs) CSA that reconnects you to your food through volunteer hours on the farm, a Milk Cow Share and a Meat Only CSA. Throughout the summer they offer children’s working day camps and foradults, food preserving classes. With a focus on education and self-reliance, individuals and families can choose to help grow and preserve the food they consume by joining anyone of the options Amy’s Meats offers. Seasonal pasture-raised chicken & eggs, pork, lamb, heirloom vegetables, strawberries, blackberries. Wild gooseberries, black raspberries, and elderberries. Turkey Red winter wheat, corn (for cornmeal), broomcorn. Handmade brooms, milk soap, lotion made with beeswax, corn meal,popcorn, lard, teas, extracts. Flowers are the primary focus at our farm and design studio, where 1.5 of our 16 acres is devoted to floral production. The flower farm is a beautiful space with paths between rows, so visitors can stroll through and see crops up close. Early October is an especially colorful time, with dahlias in season. The local flower movement, on the heels of the local food movement, offers far greater variety and quality than imports. We are excited to share the freshest florals and our chemical-free, environmentally-friendly growing methods. Open during tour and by appointment. Established in 2015, Bramble Rose Farm is a first generation farm that strives to provide high quality produce using natural growing practices like pest control, weed management, minimal tilling,no dig and composting. They employ a variety of gardening techniques including Square Foot and Mittleider gardening plus Premaculture, Hukelkultur and Back to Eden methods. Through these different methods they compliment and integrate their vegetables at a high density to increase yield, maximize their small spaces, and improve soil biology. They have two green houses and one high tunnel to extend their growing season and provide a CSA program. The future of the farm is very exciting, as they plan to grow the orchard, hold farm-to-table dinners and open a farm sto re. Ope n during tour and by appointment. Online store available. The future of the farm is very exciting. We plan to increase our orchard, have farm to table dinners and open a farm store. Open during tour and by appointment. Online store available. They have a small retail shop, tasting room and offer people a stroll through the vineyards, they can handle some small events as well. 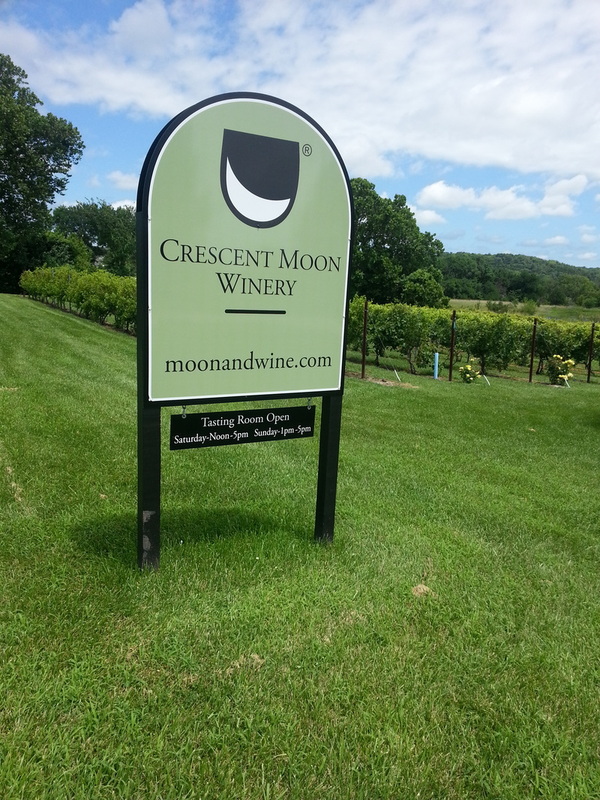 Crescent Moon Winery is a small family owned Kansas Farm Winery just north of Lawrence that opened one year ago! Their delightful tasting room provides a venue for sampling the wines while enjoying the picturesque country views. Stroll through the magnificent vineyards, sample superb wines, or simply sit for a while on the patio and take in the magnificent vantage point of the valley. The complete experience of the wine and how it comes to be is what makes Crescent Moon Winery what it has become today. We have an affection for making our wines appeal to a range of tastes, from dry through semi-sweet, to sweet and currently grow eight grape varieties to accomplish just that." Their white grapes are Vignoles, Seyval Blanc, Chardonel, Edelweiss and Gruner Veltliner. The red grapes they currently grow are Noiret, Norton and Chambourcin. Enjoy an afternoon with a picnic lunch and enjoy their peaceful setting. "We have enjoyed meeting so many great customers over the last year and look forward to many more!!" Fridays and Saturdays from 1 to 6 pm. Happy Apple’s Farm is dedicated to engaging people of all ages in exploring and learning about nature through the use of native plants in home landscapes. The farm, named for the late Vivian Ragsdale (the original “Happy Apple”), is cared for by Brent and Patti Ragsdale. The Ragsdales specialize in growing plants that are native to North America and well-adapted to growing in our area. The native flower gardens around their home display almost all of the plants they grow giving customers the opportunity to see how native plants perform in gardens. In addition, the farm’s herd of seven alpacas help to manage the pasture areas and produce super-soft fiber for yarn and other fiber products. their knowledgeable and friendly hospitality team. Holy-Field wines have been distinguished with 9 Jefferson Cup Trophies and numerous other international wine awards. an authentic "Drink Local" winery! Cheers to agriculture! Established in 2006, Juniper Hill Farms is a first generation farm owned and operated by young farmers who are committed to raising the highest quality products in sustainable and environmentally-friendly ways. Today, they grow five acres of certified organic vegetables, along with nearly 900 acres of hay, alfalfa, and small grains. As a quickly growing operation, Juniper Hill Farm believes in not only growing fresh and affordable produce for our region, but also growing new farmers. Enjoy a hayrack ride, the farm's scenic view of the Kansas River Valley, and learn about their growing practices. Farm Products: Hay, alfalfa, small grains, soybeans, beets, brussels sprouts,watermelon, popcorn, cabbage, cilantro, head and leaf lettuces, kale, onions, parsley, peppers, potatoes, radishes, tomatoes, squash, and hops! Saturday: 9:00 a.m. - 5:00 p.m. Sunday: Noon - 5:00 p.m.
Lamborn Farm is a fifth generation, family owned and operated , century farm founded in 1877. In 2012 their farm obtained a listing on the National and State Register of Historic Places. Visitors can tour our historic farm, which includes a recently restored 100- year- old horse barn and antique farm equipment. Children and adults alike will have fun feeding the animals, hunting for peacock feathers,racing through the hay mazes, swinging on the tire swings, racing around the tire track on pedal carts, having a snack at their food stand and taking a hay ride out to the pumpkin patch to find the perfect pumpkin or gourd for Halloween. Please contact us for availability of our facility for your parties, weddings and events! Farm Products: Alpacas, alpaca products, honey and eggs.Manna Meadows Alpacas started raising alpacas about 8 years ago with 9 animals. Owners Brian (country boy) and Sharon (city girl) have fallen in love with both the animals and the farming lifestyle. The business has grown to their current 46 huacaya alpacas which they love sharing with the community. Events like the Kaw Valley Farm Tour provide an opportunity to educate others about alpacas and the alpaca industry. Visitors to Manna Meadows have the chance to get “up close and personal” with alpacas. Everyone has the chance to view and touch them and even take them for a walk. There is always an alpaca-related activity especially for children and hayrack rides, weather permitting. Information about the origin of alpacas, their unique value, and other interesting facts are featured in the educational tent. Spinning and weaving demonstrations are ongoing as well. Alpaca products produced on the farm as well as by other companies are available for purchase. Rowe Ridge Vineyard & Winery, the first vineyard in Wyandotte County, is located just north of the Kansas Speedway. Owners Marc and Pamela Rowe planted the first grapevines in 2005. The vineyard is now five acres with 2900 vines. We grow 10 varieties of grapes and produce a variety of grape and fruit wines. All grape wines are estate grown and handcrafted. Visitors are welcome to taste wine and browse the gift shop in the tasting room and stroll through the vineyard. Watch the winery's Facebook page for current news, music and art events, and fall harvest events. Small Mission Farms is located just south of beautiful Tonganoxie on Hwy 24/40. The farm was started to help Chris and Lizz prepare for their ultimate goal of going overseas to share the Gospel and be full-time missionaries. They started telling folks about what they were doing on their farm and that led to sharing the extra with friends, family and the community. Their family is seeking to be self-sustaining and produce what they need to provide for themselves and have surplus for those around them. They are a very small farm, figuratively and literally, as their last name is Small and they have some of the smallest and largest breeds of their animals. They have Flemish Giant rabbits, Pygmy and Nigerian Dwarf goats, Brahma and Bantam chickens, as well as ducks, cats and dogs (which include a Chihuahua and a Great Dane/Black Lab mix) with more animals being added constantly. Their animals each have a purpose on the farm but they are also loved as part of the family. They are also unique in that they have the current record holder for the world’s hottest pepper as well as the previous record holder in their garden. So, if you like spice they have it! They also handcrafted jewelry from coins and vintage silverware and will have live demonstrations, so bring your coins and silverware and get a keepsake while you wait!